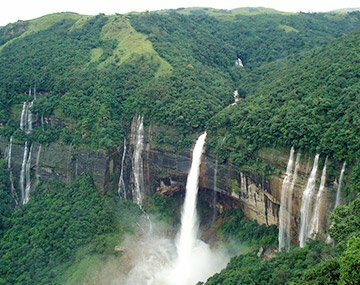 Start your fascinating journey to the most beautiful north east region of India with the arrival at Bagdogra Airport or New Jalpaiguri Railway station where one of our representative will greet you and help you to get transferred to Darjeeling which is around 59 Km by road from the airport. Darjeeling is one of the prettiest hill stations of India located in the northern part of West Bengal. It is renowned for its world famous tea estates and magnificent views of snow-dusted Kanchenjunga. Upon arrival, check into the pre-booked hotel and enjoy rest of the day at leisure activities with dinner and overnight stay at the hotel. In the morning post breakfast leave for the sightseeing tour of Darjeeling. The most famous attraction of it is Darjeeling Himalayan Railway or the Toy Train which runs between Darjeeling to Jalpaiguri and is declared a UNESCO world heritage site. Then visit the Singalila National Park, Padmja Naidu Himalayan Zoological Park etc. Reach the Tiger hill by foot or by jeep to capture the beautiful views of Kanchenjunga and the monolithic Mt. Everest. Later on, visit the Batasia Loop, Happy Valley Tea Estate etc. Return back to the hotel for dinner and overnight stay. The 3rd day of your Darjeeling and Gangtok tour package post breakfast check out from the hotel to proceed towards Gangtok which is 96.8 Km from Darjeeling and the beautiful capital of Sikkim. It is a mystical wonderland of spectacular scenery covered with snow-capped mountains, lush meadows along with an infinite variety of flora and fauna that offers surreal experience to its visitors. Upon arrival, check into the pre-booked hotel and enjoy rest of the time exploring panoramic beauty of the surroundings or at leisure activities. Return back to the hotel for dinner and overnight stay. Post breakfast proceed for the sightseeing tour of Gangtok which includes a visit to Tsomgo Lake, Changu Lake, Rumtek Monastery, Hanuman Tok, Ban Jhakri Falls, Ranka Monastery etc. Return back to the hotel for dinner and overnight stay. Today After breakfast get ready for an excursion to Tsogmo Lake which is located 35 Km away from the city on the Gangtok- Nathula highway which is the oldest route that links India and China. The lake is located in the restricted area and is considered sacred by the local. Tourists require an Inner Line Permit to visit it. They can also visit a small temple dedicated to Lord Shiva on the lake side. Further 12 Km from lake is the Baba Harbhajan Singh Memorial Mandir dedicated to brave Indian Army soldier. Return back and if time and energy permits enjoy shopping at the local markets of the city with dinner and overnight stay at the hotel. • Any Indian Nationality visiting Sikkim is required to carry a Photo ID Proof (Voter ID / Passport / Driving License – with address) in order to obtain Tsomgo Lake permit for the above. • Non Indian Passport holders are not allowed to visit Baba Mandir. Today morning of your Darjeeling Kalimpong Gangtok tour package proceed towards Kalimpong after morning breakfast which is located at a distance of 80 Km from Gangtok. Upon arrival, take some rest and then enjoy the sightseeing tour around Kalimpong and visit some of its hot spots like Delo Park, Phodong Monastery, Durpin Monastery, Mangal Dham Temple, Kalimpong Cactus Nursery etc. Return back to the hotel for dinner and overnight stay. On the last day of your journey, check out from the hotel post breakfast to get transferred to New Jalpaiguri Railways Station or Bagdogra Airport for return journey. North Eastern part of the India is often referred as the land of seven sisters. It is a land of undulating hills and plains covered with luxuriant green cover that is the habitat of most amazing wildlife of the country. It is the land which is untouched by modernization offers a great respite from the hustle and bustle of urban life. Each state of North India is beautifully enriched with its own cultural heritage which makes it even more unique. So book north east India holiday package now and explore the unexplored India. Planning a trip all by yourself is not an easy job. If you are planning a vacation for your whole family or for a group of friends or want to celebrate your honeymoon to the most beautiful destination then you surely need a trusted travel partner. BookOtrip is one such travel partner that helps you to get the best deals on flights, accommodations, car rentals, travel insurance etc so that you can enjoy the maximum. Transfer from NJP/ Bagdogra are provided from 0600Hrs to 1600Hrs, so please ensure that the Air/Rail Tickets are booked and correspond to the above timings as any of the above destinations from/to NJP / Bagdogra is around 2.5Hrs to 5Hrs drive in the hilly road and the condition of which is not safe to drive without the sufficient day light, therefore we do not operate or recommend any airport or railway station transfers between 1600Hrs to 0600Hrs. I had gone with my family and the trip was too good . The view as awesome. I enjoyed to the fullest with my family.